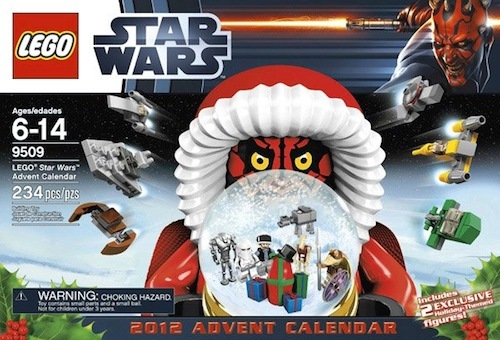 Get Christmas off to a galactic start with the LEGO® Star Wars Advent Calendar! Mini-figures include Santa Darth Maul, Snowman R2-D2, Gonk Power Droid, Gungan Warrior, Hoth Rebel Trooper, Imperial Officer (Hoth), Rebel Trooper, Snowtrooper, Security Battle Droid, and Super Battle Droid. Models include AT-AT Walker, Darth Maul's Sith Infiltrator, General Grievous' Starfighter, Gungan Shield Set, Gungan Submarine, Guns and Lightsaber, MTT, Naboo Flash Speeder, Naboo Royal Cruiser, Naboo Starfighter, P-Tower Turret, Separatist Shuttle/The Lapiz Cutter, Super Star Destoyer, and Vulture Droid. This great advent calendar is the perfect gift for Star Wars fans of any age. Last year's sold out quickly due to demand. Buy yours today.